Shares of J.P. Morgan surge an average of 5.2 percent over a one-month span when rates are rising sharply, while Goldman's stock averages a gain of 3.9 percent in such instances. DowDuPont, Exxon Mobil and Visa are also among the best-performing stocks in this environment. Strong economic data and comments on U.S. monetary policy from the top Federal Reserve official have been a boon for interest rates as they reach multiyear highs. Walmart and Coca-Cola struggle during periods of higher rates. People inside the offices of JP Morgan Chase in New York City. Interest rates are surging and stocks like J.P. Morgan Chase and Goldman Sachs would make great additions to a portfolio in times like these, if history is any indication. Shares of J.P. Morgan surge an average of 5.2 percent over a one-month span when rates are rising sharply, while Goldman's stock averages a gain of 3.9 percent in such instances. Banks usually benefit from higher rates as they make loans more profitable. DowDuPont, Exxon Mobil and Visa are also among the best-performing stocks in this environment. When rates move sharply higher, DowDuPont and Exxon Mobil both average gains of 3.5 percent, while Visa posts averages a rise of 3.4 percent. 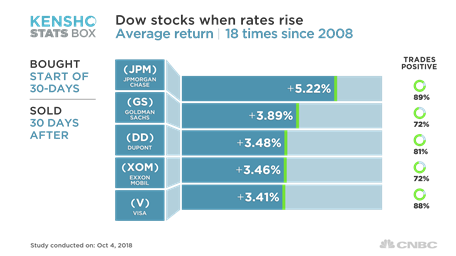 CNBC used analytics tool Kensho to determine the best-performing stocks in the Dow Jones Industrial Average when the 10-year Treasury note yield rises 25 basis points or more over a span of 30 days. There have been 18 instances of such a move happening since 2008. Last week alone, the 10-year yield rose more than 15 basis points. Strong economic data and comments on U.S. monetary policy from the chairman of the Federal Reserve were a boon for interest rates last week. On Friday, the Labor Department reported that the unemployment rate dropped in September to its lowest level since 1969. Wages, meanwhile, grew by 2.8 percent on a year-over-year basis. The U.S. services sector also expanded at its fastest rate on record last month, according to data released by the Institute for Supply Management. Meanwhile, Fed Chairman Jerome Powell said Wednesday that the central bank was "a long way" from getting interest rates to neutral, signaling more rate hikes are coming. The Fed has already raised rates three times this year and is expected to do so again in December. All of this has led the 10-year U.S. note yield — which is used as a benchmark to determine mortgage rates — to jump from around 3.06 percent on Monday to above 3.2 percent, near its highest levels in more than seven years. 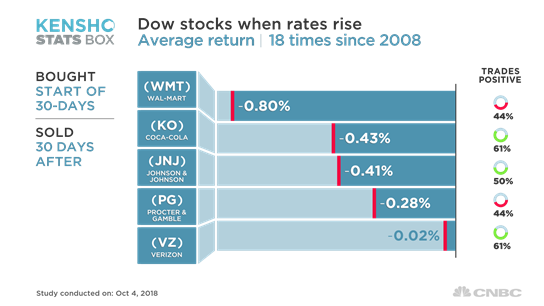 But while stocks like J.P. Morgan, Goldman Sachs and Visa do well when rates are surging, Walmart and Coca-Cola struggle. These stocks usually pay high dividends, which become less attractive when interest rates rise.